Filed under Park City Lifestyle. There are many things that distinguish Park City from other small towns: two world-class ski resorts, an Olympic training facility that allows both elite athletes and true neophytes to soar, performing arts organizations that bring in nationally and internationally acclaimed performers year-round; and a restaurant scene that rivals that of New York and L.A. But the one thing upon which most Parkites hang their hats is the town’s overwhelming altruism across the nonprofit spectrum. In Park City – and throughout Summit County – you will find many community benefits often provided by local nonprofits. Victims of domeestic violence have a safe place to go. Kids benefit from a no-cost after-school enrichment program. The uninsured can turn to a nonprofit health clinic. A ranch rehabilitates and facilitates adoption for rescued animals of all shapes and sizes. And a center provides recreation opportunities for every ability level. 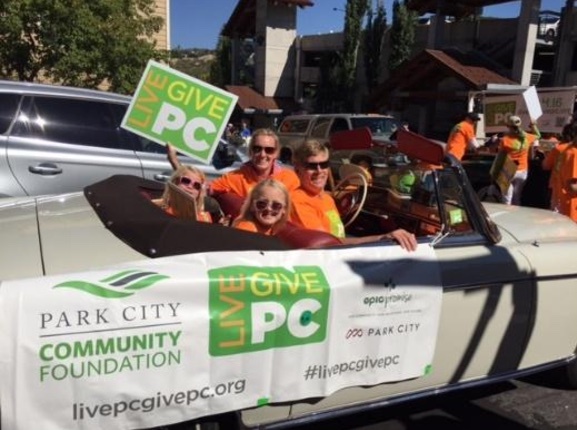 But on one day each year, locals show their support more than at any other time for the 100-plus nonprofits that make Park City one of the best small towns in America during Live PC Give PC. Over the past five years, this one-day event, established and managed by Park City Community Foundation, has raised more than $4-million for our community, with $1.3-million raised in 2015 alone. It’s a chance for everyone in the community to contribute, with donations starting at just $10. Moreover, it’s an opportunity to show our kids that philanthropy starts at home. Which is why, each year, to show my personal thanks to my wonderful home buyers and sellers, I make a donation in each of their names to nonprofits that align with their own purposes and passions. For example, I’ll be making a donation to Recycle Utah, where my client, Mary Closser, is the Education Director. Mary needed a property that allowed her to stay within the Park City School District and continue to evangelize on behalf of the conservation nonprofit, so we found her a centrally-located Racquet Club condo in Park Meadows. For Park City Council Woman Becca Gerber and her husband, Red Bicycle Breadworks owner Brent Whitford, I’ll be making a donation to The Peace House. The couple – who famously married during this year’s Miner’s Day Parade – also bought a Racquet Club condo so that Brent could continue to commute to work on his now-famous red bicycle. And for Scott “Dude” Dudevoir, manager and master boot fitter at Cole Sport, I’ll make a contribution to Mountain Town Music, whose efforts to program free, quality music experiences year-round throughout the community and in the schools truly distinguishes Park City as a center for arts appreciation and learning. We found Scott the perfect home in Francis to give him the space to host jam sessions with his band, Sin City Soul, and – at some point – a furry, four-legged baby. To check out the full list of nonprofits, visit Live PC Give PC’s site and you can make your pledge today to be counted on Nov. 4. I encourage you to give as much as you can to one – or to many – since these valuable organizations are one of the most important reasons so many visitors and residents Choose Park City year after year.